Last minute Valentines gift ideas? Check! Boots has just the thing for new! 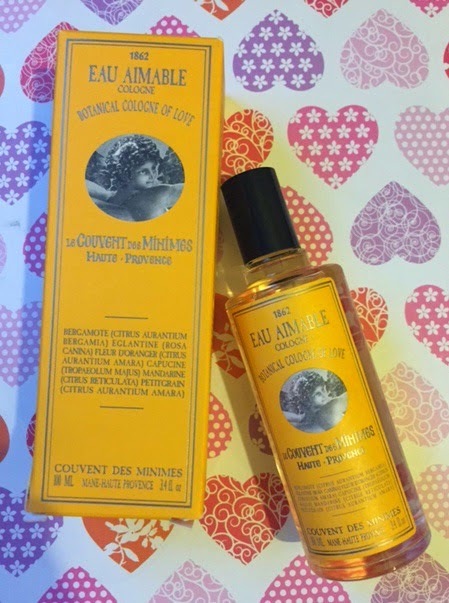 New and exclusive to Boots stores and boots.com is the Le Couvent Des Minimes Cologne of love. The new release from Le Couvent Des Minimes (what a mouthful! ), Cologne of love is inspired by orange blossom, so as you can imagine has a strong, fruity citrus scent. It combines orange blossom, citrus fruits and five beneficial plants to perfume the skin with a soft and soothing fragrance. If you are a fan of fruity and orange scents this is definitely the perfume for you, you will be smelling like fresh oranges in no time. As I said, it is limited to Boots stores, so ideal to grab as a last minute gift and retails for only £19 for a whopping 100ml, which I think is an absolute steal. In the range there is also a massage oil that retails for £15, you can buy both the cologne and massage oil together for £28 instead of £34 so a saving of £6 or you can get a full gift set for £20 that contains a exfoliating shower pulp 200ml, body butter 200ml, hand cream 25ml and also a 100g soap. If you are super quick they are also offering free next day deliveries on orders placed today so you can get it just in time for valentines day or as a treat to yourself, go on, you deserve it!